Open every day until November including all weekends and bank holidays. 10.00am to 5.00pm. We were so pleased to find the 14 freshly hatched Frizzle and Silkie chicks with their very proud mums this morning. The House on the Hill Toy Museum is one of our country’s most popular visitor attractions for both young and old. It contains the largest toy collection in the world with toys from the Victorian era right up to the 1990’s. Over 80,000 individual items on display from trains, lead and tin toys, Meccano, Action Man and Sindy to Raleigh Choppers, teddy bears, annuals, games, dolls and dolls houses. Fred and his ducklings as featured on the BBC’s The One Show on 28th May. Explore the Castle and roam through the Norman village hidden behind the castle walls, wander in and out of the many houses and view the scenes, smell the log fires burning and feel the ambience of a bygone lifestyle. Meet and hand feed the tame Fallow deer and other rescued animals that roam freely throughout the 10 acre site. Visit the only medieval Castle and Norman Village reconstructed on its original site to exist in the world. An all-weather, all-in-one heritage entertainment complex where prehistory, history and nostalgia combine to make one great full exciting day out for the whole family. Three fabulous attractions for one admission price, a fantastic family day out for all ages. 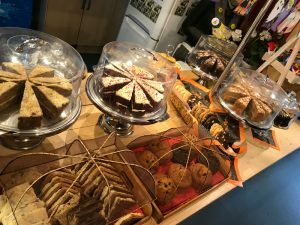 Delicious hot and cold snacks, toasties, panini’s, freshly made sandwiches, delicious homemade cakes, freshly ground coffee and speciality teas are always available in our visitors centre. We have indoor seating and a large outdoor picnic area. 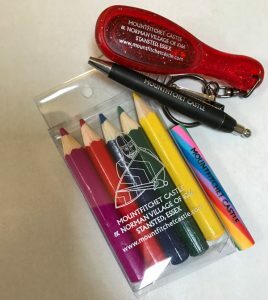 We stock a huge range of gifts and souvenirs, jewellery, accessories, books, biscuits and fudge in our shop with prices ranging from pocket money items starting at 50p to the more valuable rare collectables in our antique centre. The Toy Museum is always interested in expanding its collection. Old Toys, Lead Figures, Games, Dolls, Trains, Teddy Bears etc. Anything considered from single items to whole collections and in any condition. Also World War I & II Military Items, Medals, RAF, Uniforms, Helmets, Nautical & Aviation items. We also gratefully accept donations and put the donators name on our wall. Whilst at Mountfitchet Castle don’t forget to visit The House on the Hill Toy Museum which is included in your entry price. The Toy Museum contains the largest toy collection in the world with over 80,000 toys from the Victorian era right up to the 1990’s. View the Showbiz Collection – Only Fools and Horses three wheeled van, Dads Army display, film and TV props and life sized figures from Star Wars and Dr Who. Don’t miss the Rock ‘n’ Roll exhibition celebrating the golden era of the 1960’s and 70s. Located within the Toy Museum is The Haunted Manor, if you’re feeling brave enough Encounter our life sized dinosaurs on the way to the museum and try your hand at Fossil hunting in our Palaeontology House, can you find the Velociraptors claw? Visit the the Toy Museum’s website for full details.